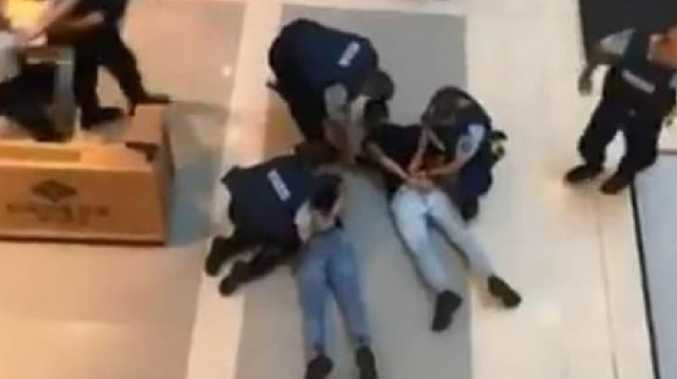 Shoppers at Westfield in the northern Sydney suburb of Chatswood witnessed the dramatic arrest tonight of four men carrying firearms through the centre. FIVE teenagers are in custody after shoppers reported the dramatic sight of a group of males carrying firearms through a Westfield in northern Sydney. Police from North Shore Police Area Command were called to the shopping centre in Chatswood at about 6.30pm. They arrested an 18-year-old man and four teenage boys aged 17 at about 6.40pm outside a supermarket and seized several replica guns. It is unclear whether the men were threatening shoppers, but police handcuffed them on the floor of the centre. Three were taken to Chatswood Police Station, and two were taken to North Sydney Police Station, where they are assisting with inquiries.